Starting and managing a business is never easy, especially when you have multiple employees to tend to. If you’ve found yourself in a position where business is booming and you’ve expanded your workforce and don’t know what to do next, the free Employee Database Management is the perfect tool to get you started. This free Excel document has all the right organization tools to help you keep track of the personal information of all your employees and more. If you’re interested in learning more about this free employee management template, then read the guide below. 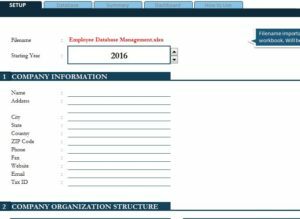 Downloading this Employee Database Management template is as easy as clicking the link provided below. Now, there is a “How to Use” tab that explains in great detail how to get started with this template, but if you just want to read the short version here, you’ll find that the Employee Database Management template is pretty intuitive. Begin in the “Setup” tab below. Here, you will be able to select the current date and enter your company information. First, enter the address, then the structure of the company. There are separate tables below to help you create a structure, like different divisions of your business and much more. As you continue to scroll down the list, you’ll see space to keep track of paid and unpaid time off. This is useful for tracking pay, employment types, and benefits. Feel free to change and adjust the information here as you see fit. All of the tabs marked “Employee” have the same information. You will just go through and enter all the fields that apply for each of your employees. This sheet keeps track of contact information, pay, position, and everything else you can possibly think up. When you want a detailed overview of all your information, after filling out all the sections above, you can go to the “dashboard” tab to see helpful graphs that display salaries over time, the number of employees over time, the turn-around for job positions, and a company budget for salaries.